This is a nice basket for children to use for Easter egg hunting! Repeat rows 9 and 10 for pattern. 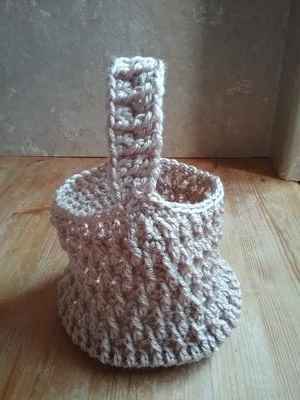 Chain 30 attach to either side of the basket, double crochet across attach to basket then turn basket 90 degrees and double crochet in first double crochet and front post triple crochet around next double crochet. Attach to the edge of the basket.